The contemporary Jahmiyyah posing as "Ash'aris" have raised an issue regarding the speech of Imaam al-Tahawi (وإن القرآن كلام الله، منه بدا بلا كيفية قولا), in particular the word (بدا) which occurs in some manuscripts as (بدأ) and which is in agreement with narrations from the Salaf who preceded Imaam al-Tahawi. In this series we want to address the claims of one considered to be from the kibaar (senior) amongst the Jahmites, Saeed Foudah (pictured). Historically, the Jahmites have always been considered corrupt in intellect and our case sample (Foudah) in these articles will be a confirmation of this trend. The reader will find truly laughable the attempt of Saeed Foudah to distort the statement and intent of Imaam al-Tahawi (in its historical context) who clarified the creed of Ahl al-Sunnah with respect to the Arabic Qur'an. The key lesson to take away from this series is that history is one of the routes through which the lies and fabrications of the deviants and innovators are exposed. 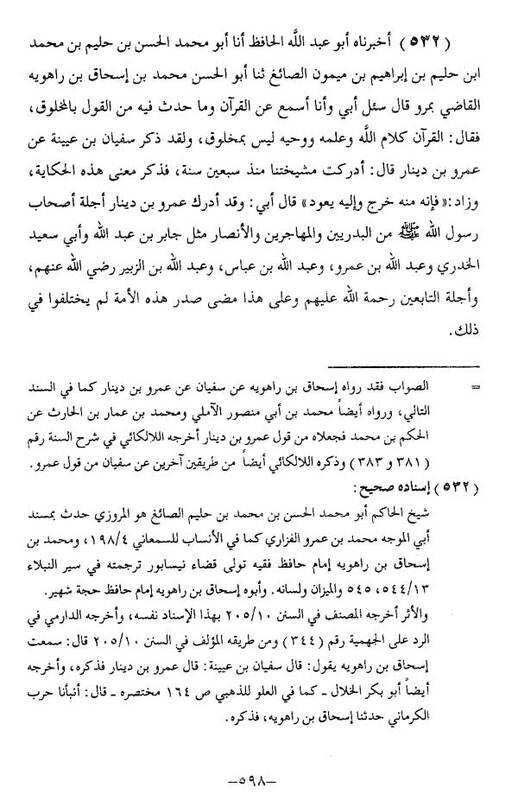 It is known that the Sahaabah, the Taabi'een, the Muhadditheen and the Scholars of Ahl al-Hadeeth have utilized history and the historical record to falsify matters which on the surface appeared to be authentic and coherent, whether that be in relation to claims of history or chains of narration. One should also note that people like Saeed Foudah and their ancestors are the students of the Hellenized Jews, Christians and Sabeans and they are not the students of the Sahaabah, Taabi'een and Taabi' Taabi'een. The isnaad (chain) of their theological speech goes back through the Jahmiyyah and Mu'tazilah to those same Hellenized Jews, Christians and the Philosophers amongst the Sabeans and eventually to Aristotle bin Nicomachus (d. 322BC) whose speech about the "first cause" is the actual foundation of speech regarding the deity of the Ahl al-Kalaam. At least al-Qaradawi is very frank and open about it. See the little incident in the kitchen between al-Qaradawi and G.F. Haddaad, (domestic problems in the house of kalaam) to learn more. In Part 1 of this series we summarized six points that are to be found in Saeed Foudah's commentary on al-Tahawi's statements regarding the Qur'an and we gave a brief historical account as to why, when and how the doctrine of two Qur'ans came to be, one that is uncreated (in ma'naa) and the other created (in lafdh). This goes back to the debates between the Mu'tazilah and Ibn Kullaab where Ibn Kullaab innovated a new third saying (in addition to that of the Salaf and that of the Mu'tazilah). The two foundations for this new third saying lie firstly in the opinion of star and idol worshippers of Greece (the "first cause" does not act through will and choice) and secondly the alleged opinion of a cross-worshipping Trinitarian Christian (speech is just meaning in the self). As for the revealed Books and sent Messengers, they came with affirmation of Allaah speaking and acting through his will and choice, this being from utmost perfection and not, as per the view of the people of Kalaam [Jahmiyyah, Mu'tazilah, Ash'ariyyah, Maturidiyyah] operating on the conceptual baggage of those star and idol worshippers, that this necessitates he is a body (jism) and is therefore kufr. The entirety of the Salaf of the first three generations (or centuries) are against those Jahmites (and their later offshoots) in this regard. In this article we want to document the saying of the Salaf that (القرآن كلام الله منه بدأ وإليه يعود), "the Qur'aan is the speech of Allaah, it commenced with Him and to Him shall it return" and explain the meaning of this statement as intended by the Salaf in refutation of the Jahmiyyah and Mu'tazilah, which is that Allaah is the one who first spoke the Qur'an, the Qur'an coming from Allaah as actual speech (that is heard), since this was the thing being denied by the Jahmiyyah and Mu'tazilah in that era. And al-Marrūdhī Ahmad bin Muhammad reported, saying: Imām Ahmad bin Muhammad bin Hanbal said (rahimahullāh): I met the men, the scholars, the jurists, in Makkah, Madīnah, Kūfah, Basrah, Shām, Khurasān, al-Thughūr, and I saw them upon the Sunnah and Jamāʿah, and I asked the Fuqahā about it, and all of them were saying, "The Qurʾān is the speech (kalām) of Allāh, uncreated, (منه بدأ وإليه يعود) from Him did it commence and to Him shall it return. The Qur'an is the speech of Allaah, not created. From Him did it commence and to Him shall it return. Whoever said other than this has disbelieved. The Qur'an is the Speech of Allaah, He dictated it to Jibraa'eel and Jibraa'eel dicated it to Muhammad (sallallaahu alayhi wasallam). From Him did it commence and to Him shall it return. I met our Shaykhs from seventy-years ago (all) saying: The Qurʾān is the speech of Allāh, it commenced from Him and to Him shall it return. I reached the people since seventy years (ago), all of them saying: Allāh, lofty be His name, is the Creator, and whatever is besides Him is created, except the Qurʾān, for it is the speech of Allāh, the Exalted. From Him did it emanate and to Him shall it return. My father said: Amr Bin Dinar met the loftiest of the Companions of Allaah's Messenger from the people of Badr, the Muhajiree and the Ansar, such as Jabir bin Abdullaah, Abu Sa'eed al-Khudree, Abdullaah bin Amr, Abdullaah bin Abbaas, Abdullaah bin Zubayr (radiallaahu anhum) and the loftiest of Taabi'een (may Allaah have mercy upon them) and upon this have the heart of this ummah proceeded, they did not differ about that. Whoever claims that the Qur'an is two things, or that the Qur'aan is a hikaayah (quotation), then he is, by Allaah, besides whom there is none worthy of worship, a zindeeq (heretic), kaafir (disbeliever) in Allaah. This Qur'an is the [very] Qur'an that Allaah revealed upon the tongue of Jibreel, upon Muhammad (sallallaahu alayhi wasallam). It it is not changed or altered. "Falsehood cannot reach it from in front nor from behind, it is a revelation (tanzeel) [sent down] from the all-Wise, all-Praiseworthy" [41:42], as Allaah, the Mighty and Majestic said: "Say: If [the whole of ] mankind and the jinn gathered together to bring a like of this Qur'an, they would not be able to bring a like of it, even if they were helpers to one another." (al-Israa 17:88). And if a man swore an oath that he will not speak today, then he recited the Qur'an, or prayed, reciting the Qur'an (therein), or made salutation in the prayer, he would not have broken his oath. Nothing is to be analogised with the Speech of Allaah. The Qur'an is the Speech of Allaah, (منه بدأ وإليه يعود) it commenced with Him (i.e. He spoke it), and to Him will it return. Nothing from Allaah is created, neither and nor are His Attributes, nor His Names, nor His Knowledge. Note that this speech is a powerful refutation of Saeed Foudah and you would do well to read the full article "Ahmad bin Sinan al-Waasitee (d. 258H): Shaykh of al-Bukhaaree and Muslim Sends Jahmite Ash'aris Fleeing From Their Secret Hideouts: 'Whoever Says the Qur'an is Two Things Or a Hikaayah is, by Allaah, a Zindeeq, Kaafir" (see here) for all of it can be used as a refutation of the deception that Saeed Foudah has attempted to bring over the statement of Imaam al-Tahawi. It is intended to answer the question of this Qur'an, what is it and where did it come from? The Jahmiyyah said it is a created thing. The Mu'tazilah likewise, said the Qur'an is a created thing because Allah does not have any attributes (according to both factions). Rather, His attributes (to the Mu'tazilah) are created entities which can be ascribed to Him. Allaah's "power" means the power of the wind, the ocean, and other manifestations of power in the creation, not an actual attribute ascribed to His essence, but created manifestations of power that can be said to belong to Him, just like it is said, "Allaah's House" and "Allaah's Messenger." In a similar way, they said Allaah's speech is that which He creates in others. Then there came Ibn Kullaab and the Kullaabiyyah after the tribulation of the creation of the Qur'an in the early third century, and they agreed with the Jahmiyyah and Mu'tazilah that this Arabic Qur'an is created (due to falling prey to their doubts regarding Allaah's will and choice) and alongside this they were hard pressed to affirm the attribute of speech, so they innovated the kalam nafsee doctrine for this end. The outcome is exactly the same, that the Arabic Qur'an is created, the same Qur'an that the Jahmiyyah and Mu'tazilah intended (since all Muslims without exception never knew except one Qur'an), but now they had a new, unheard of attribute to make it appear as if they had affirmed the attribute of speech, when it was no such thing in reality. Hence, they (like the Jahmiyyah and Mu'tazilah) were forced to deny that the Qur'an was spoken by Allah with actual speech. However, they had to explain where this Qur'an came from as we have it in the Arabic language. So some of them said Jibreel was inspired with the meaning and He expressed it and others said the Messenger (sallallaahu alayhi wasallam) expressed it. And a third saying is that Allaah created it in the Lawh al-Mahfudh. This third opinion is a preferred saying because it allows the deception to be made by the contemporary Jahmites in their saying, "Both the meaning and the wording is from Allaah without any created being intervening to express the wording" without them revealing that by wording they mean "created wording" since Allaah, according to them, created it in the Preserved Tablet from where Jibreel took it subsequently. For confirmation from the Ash'aris that they are in agreement with the Muta'zilah that the Qur'an is created see here and here ( al-Bayjuri), here (ar-Razi), here (al-Juwaynee) and here ( al-Buti). All of these are frank and honest unlike Saeed Foudah. Don't forget to read the following too: Ibn Qudaamah on the Ash'arite heretics holding the two Qur'an doctrine (in secrecy and fear): (see here) - this explains the activities of people like Saeed Foudah. Ahmad bin Sinaan al-Waasitee (d. 258H), Shaykh of al-Bukhaaree and Muslim (see here). And at-Tabari (d. 310H) could not have said it better and clearer see here. And watch Ibn Battah (d. 387H) lift the lid (see here). May Allaah reward these Imaams of the Salaf for clarifying the truth and in their speech is an exposition of the deceiver Saeed Foudah. To all of these factions (in their respective times) the Salaf said (القرآن كلام الله غير مخلوق منه بدأ وإليه يعود), and the intent here was to say that the Qur'an was spoken by Allaah (through His will and choice) with actual speech that was heard by Jibreel (alayhis salaam). That it was not created "laa fee mahall" (in no place) as the Mu'tazilah say, and nor that it commenced as the speech of Jibreel or Muhammad (sallallaahu alayhi wasallam) being an expression (ibaarah) or quotation (hikaayah) of the meaning (ma'naa) present with Allaah and nor that it was taken by Jibreel only and directly from the Preserved Tablet into which Allaah had placed the wording. The Salaf intended that Allah actually spoke it and it commenced with Him as speech (Kalaam, qawl) and revelation (wahy), and in whichever way it is conveyed - whilst the medium of conveyance is created (reciter's Voice, written mus-haf with ink, paper) - the words conveyed are uncreated because they commenced as Allaah's uncreated speech with a true and real speech that was heard and which is unlike any speech of the creation. And this is the very doctrine espoused by al-Tahawi in his creed which Saeed Foudah attempts to distort and twist in a despicable type of way as we shall see inshaa'Allaah. Why Are These Feeble-Minded Jahmites Confused? The answer to this question comes back down to what was mentioned in Part 1: They followed the star and idol-worshipping Philosophers of 4th century BC Greece in denying Allaah's will (mashee'ah) and choice (ikhtiyaar) in blatant opposition to every revealed Book, every sent Messenger and every companionship of every sent Prophet and in opposition to the language of the Arabs. As a direct result of this, they wrongly thought that when Ahl al-Sunnah say, "The Qur'an commenced with Allaah as speech" this can only mean that Allaah acquired the attribute of speech (Kalaam) after not having it, and hence the addition of a new attribute means He was imperfect prior to it. They can only arrive at this conclusion because they deny Allaah speaks and acts through will, choice. Now the claim of Allah acquiring attributes He never had before in principle is not the saying nor the laazim (binding necessity) of the saying of Ahl al-Sunnah, but it is the saying of another Kalaam faction, called the Karraamiyyah. They held this view because they were also holding onto that false corrupt argument of huduth al-ajsaam (kalam cosmological argument). They simply proposed a different way of validating its major underlying premise (impossiblity of an endless chain of events in the past). So they said, Allaah acquired attributes (those requiring an exercising of will and choice) after not having them but they remained permanent thereafter, and through this they claimed to have avoided an endless chain of events in the past (as in Allaah being one who eternally speaks and acts according to His will), and they also denied they were affirming hawaadith (events) in Allaah's essence, because they said an event is what occurs and expires, whereas these attributes Allaah acquired do not subsequently expire and end, hence they cannot be understood to be hawaadith. This was their method of validating the argument and remaining true to all its premises. So all of these groups from the Kalam dynasty, the Jahmiyyah, Mu'tazilah, Kullaabiyyah, Karraaamiyyah, Ash'ariyyah, Maturidiyyah, Saalimiyyah, they are all united upon the foundations of this corrupt theology, but they were led to different sayings based on the way they attempted to validate the underlying premises. It is here that Jahmites such as Saeed Foudah demonstrate either their ignorance and confusion or their wilful deception. For Ahl al-Sunnah affirm, upon the Book, the Sunnah and consensus that Allaah speaks and acts through will and choice and that His attributes such as Kalaam (speech), qudrah (power) and so on are eternal from an aspect, they are also tied to Allaah's will and power from another and hence, Allaah speaks and acts as and when He wills, and whenever Allaah exercises His will in relation to those attributes, it in no way means that those attributes are created or came to be after not being. Rather, Allaah is eternally one who speaks and acts as and when He wills. This is the saying of Ahl al-Sunnah, exemplified in Imaam Ahmad's refutation of the bid'ah of the Kullaabiyyah, wherein he said, (لم يزل متكلما إذا شاء). When the Jahmites and all their offshoots in the Kalam dynasty rejected this matter of Allaah's will and choice, then they departed from both reason and revelation, and this is why it is binding that the aql of anyone who builds this theology upon kalam is automatically compromised, and hence we will start seeing foolishness, contradiction, inconsistency emanating from his speech. This is what we shall observe and witness in the next part to this series, when we analyze the full passage of Imaam al-Tahawi and Saeed Foudahs' distortion of it. In this article, we documented the fact that the statement (منه بدأ), "From Him it commenced..." and in particular the word (بدأ) has been narrated from the Salaf and that al-Tahawi took this wording and meaning from the Salaf, and the intent is to refute the Jahmiyyah, Mu'tazilah and Kullaabiyyah all of whom claim Allaah never spoke the Qur'an with actual speech (and thereby the Arabic Qur'an is not His actual speech). Due to a variation in the wording in the manuscripts of al-Tahawi's creed where some manuscripts use the word (بدا), Saeed Foudah and his likes have attempted to distort both history and the intent of al-Tahawi within the context of that history. In the next article we will analyze and make comparison between the doctrine of the Salaf and Imaam al-Tahawi on the one hand, and on the other, that of Saeed Foudah and his Jahmite ancestry.